On another Thanksgiving Day 150 years ago, America was embroiled in a bitter Civil War. A year later, expressing gratitude for the key Union Army victory at Gettysburg, President Abraham Lincoln would proclaim that the nation will celebrate an official annual Thanksgiving holiday on the fourth Thursday of November. But in 1862, 25 states and three territories were already celebrating the Thanksgiving holiday. Guest blogger Sonya Kunkle was a writer and editor for more than 15 years before she joined GPO’s Proof & Copy Markup section. Here she reviews a U.S. Government Bookstore booklet on a topic that caught her interest fairly recently—the American Civil War. As a child growing up in the Washington, DC, suburbs, I once walked through the grassy fields of Antietam Battlefield (near Sharpsburg, MD) oblivious to the historical struggle waged under my feet. American history wasn’t my favorite subject in school, but as an adult my interest in the Civil War was sparked when I read “The Killer Angels,” a novel by Michael Shaara. “The Killer Angels,” a work of historical fiction, details the Battle of Gettysburg. This is a good time to be a Civil War history enthusiast, with 2012 being part of the sesquicentennial (150-year anniversary) of America’s bloodiest war. To mark the occasion, the U.S. Government Bookstore has for sale a 64-page booklet, The Civil War Begins: Opening Clashes, 1861 published by the U.S. Army’s Center for Military History. Image: (Cover of the booklet,. Detail from Capture of Ricketts’ Battery by Sidney E. King, courtesy of William V. Fleitz, Manassas Battlefield Park. In this booklet you can read about the reasons for going to war and why key players made many of the decisions they did during the first year of the conflict. The author, Dr. Jennifer M. Murray, also provides a lot of information in text and graphics on the troop movements of both the Federals and the Confederates during each of the key battles of 1861. If you look at the numbers, perhaps the Confederates were doomed from the start. The 1860 Census shows that the Union could call on 4 million military-age white males to build their army, whereas the Confederacy could assemble 1 million at most. The Union also had 10 times the industrial capacity, not to mention better transportation capabilities. In spite of these disadvantages, the South started the Civil War with its first big move—firing on Federal Fort Sumter in South Carolina. Charleston, South Carolina, was well fortified with Fort Sumter and other defenses. Sumter was built to guard against an enemy fleet, and the walls facing the city were much weaker than those facing the water, leaving the fort vulnerable to attack on land. On April 11, the Southern Brigadier General Pierre G. T. Beauregard demanded that the Union forces evacuate Fort Sumter. The North’s ranking officer at Sumter, Major Robert Anderson, declined. At 3 a.m. (or 0300; the author uses military time) on April 12, the Confederates notified Major Anderson that General Beauregard and company would open fire on Fort Sumter in one hour. Twenty minutes after the deadline, a single shell from nearby Fort Johnson, which the North had abandoned, exploded over Sumter. War had begun. 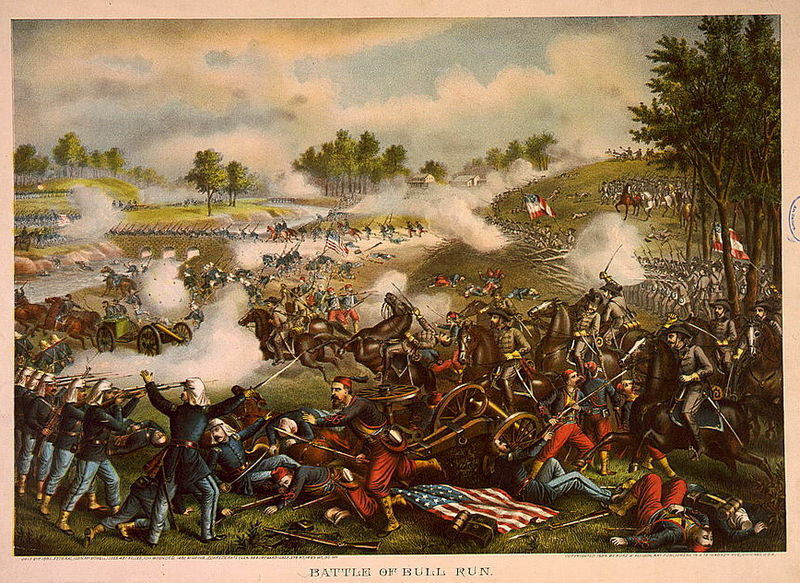 Image: First Battle of Bull Run. 1889 chromolithograph by Kurz & Allison. Source: Library of Congress. CLICK TO ENLARGE. In May the Confederates moved their capital from Montgomery, Alabama, to Richmond, Virginia. Richmond became a strategic target for the North, both for its industrial capability and its political importance. The two capitals, separated by only 100 miles, now figured prominently in both sides’ strategies. The Civil War Begins: Opening Clashes, 1861 explains why the Union was determined to control Manassas Junction and why in May 10,600 Confederates defended the northern entrance to the Shenandoah Valley. 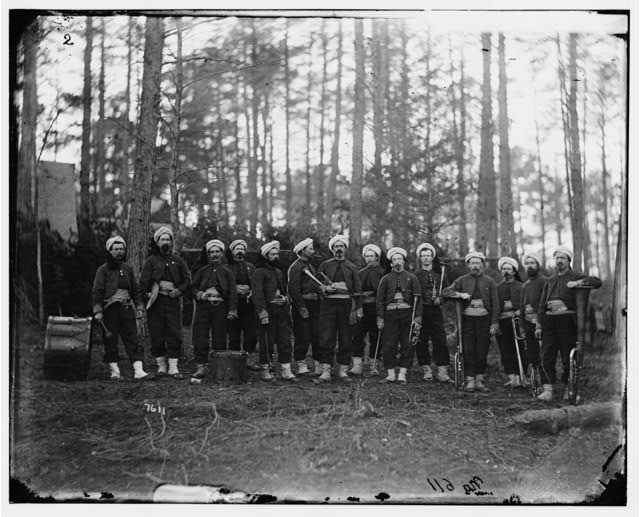 Image: Brandy Station, VA, Band of the 114th Pennsylvania Infantry (Zouaves). Source: Library of Congress, Prints & Photographs Division, LC-B8171-7611 DLC. CLICK TO ENLARGE. The Confederates won the fight, protecting their capital. The first battle of the Civil War resulted in the death of nearly 5,000 men. While emotions roiled to the east, the majority of delegates attending a special Missouri secession convention voted to remain in the Union. This decision ran counter to Governor Claiborne F. Jackson’s personal preferences, and he mustered forces in favor of the Confederates. This part of The Civil War Begins: Opening Clashes, 1861 provides details about how the Civil War reached into Missouri, with one of the key players being Union Brigadier General Nathaniel Lyon. While directing his men on the front line, Lyon got hit in the calf by a bullet, so he left the field for medical treatment. When Lyon got back on the field, a bullet grazed his head. Determined to continue the fight, and apparently not taking the hint, Lyon returned to the field. Moments later, a bullet hit him in the chest. He was the first Union general officer to die in the Civil War. 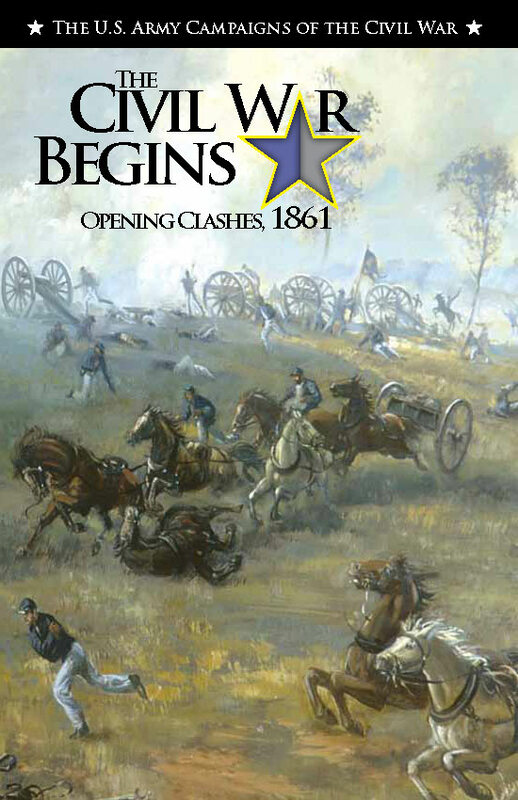 In The Civil War Begins: Opening Clashes, 1861 you can read about the Union Navy’s entry into the Civil War. It’s an interesting read, with a little information about Southern pirates (pirates!) lurking inside the Outer Banks of North Carolina, pouncing on merchant vessels before Union warships could react. To thwart these outlaws, the Federal Navy designated the Outer Banks as its first target. Union forces prepared for the war’s first joint Army-Navy operation. You learn something about the battle for Fort Hatteras and the naval tactic (and the Confederates’ faulty ammunition) that helped the Union win the day. The Union’s euphoria didn’t last long. The Civil War Begins: Opening Clashes, 1861 describes what happened between the North and South about 35 miles north of Washington at Ball’s Bluff. Perhaps the statistics are most noteworthy—there were an evenly matched number of men fighting on both sides, but the outcome was lopsided in terms of soldiers wounded and captured. The battle’s uneven results favored the South. This section also addresses the Union’s win at Port Royal, South Carolina. Here you also can read about what Brigadier General (and future U.S. President) Ulysses S. Grant did in the area of Belmont, MO, that earned him President Lincoln’s favor. The chronological coverage of the war ends with Union Major General George B. McClellan’s training the Army of the Potomac outside of Manassas. McClellan said he believed that he controlled the “destinies of this great country.” There was no further action along the Potomac as the curtain closed on 1861. Dr. Murray offers incisive analysis at the end of The Civil War Begins: Opening Clashes, 1861. She describes the early missteps of the secessionists, as well as what the South got right. She also notes the Union army’s mixed results. The last page of the booklet provides a short list of texts for further reading about the first year of the war. The Civil War Begins: Opening Clashes, 1861 helps me to appreciate the history in my own backyard. Although I find all of the information about the armies’ positions and movements a bit overwhelming, the booklet tempts me to take the 70-mile trip from Baltimore, where I live now, to explore the fields of Bull Run at Manassas. Taking the booklet with me, I’ll have a better understanding of the history I’m walking through. HOW DO I OBTAIN The Civil War Begins: Opening Clashes, 1861? This entry was posted on Thursday, November 22nd, 2012 at 1:09 pm and is filed under Center of Military History, Civil War, Military History, Presidents, U.S. Army, U.S. History, U.S. Navy. You can follow any responses to this entry through the RSS 2.0 feed. You can leave a response, or trackback from your own site. writing style surprised me. Thanks, great article. Civil War made The United States different if we compare with the other countries in the world. It was upside-down the rule of shaped of the communities cultures and being impact of the future nations!